Who actually paid the £2.5 million to help the SFA buy Hampden? The Scottish Football Association yesterday struck a deal to buy Hampden from Queen’s Park FC, in a £5 million deal that would allow the Spiders to relocate to, and redevelop, Lesser Hampden as their new stadium. Scottish football’s governing body claimed in a statement that former Celtic non-executive director Lord Willie Haughey had been instrumental in the sale, donating a substantial amount - reported to be £2.5 million - of the total amount. However, it has emerged that Scots entrepreneur Sir Tom Hunter - estimated to be worth more than £1 billion - pledged to match Lord Haughey’s contribution. But instead of donating £2.5 million, the former Sports Division owner and the peer are each contributing £1.25 million to the sale price. Speaking on talkSPORT on Wednesday morning, Haughey joked that the money had come from Scott Brown’s testimonial. 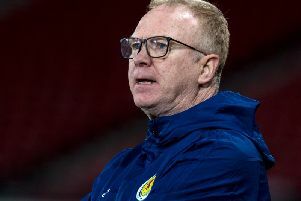 The former Scotland captain caused a stir late on Tuesday after he described the national stadium as being “one of the worst I’ve played in for atmosphere”. Haughey said: “I hear that Scott Brown is not happy. He will be even worse this morning when I tell him I gave his testimonial money towards the £2.5 million. Haughey and Hunter have also vowed to discuss further investment with a view to helping transform Hampden into one of Europe’s leading arenas, and giving Scottish football “the home it truly deserves”.